a portion of food or foods taken at some particular and usually stated or fixed time. congregate m's a group nutritional program for socially isolated individuals whose nutritional problems are related more to access and to lack of social stimulation than to mechanical eating difficulties. test meal see test meal. oral administration of barium sulfate suspension for radiographic study of the upper gastrointestinal tract (British usage). See also: barium sulfate, barium swallow. Oral administration of barium sulfate suspension for radiographic study of the upper gastrointestinal tract. An X-ray examination enhanced by the use of the insoluble barium sulphate, usually in the form of a liquid suspension. Barium is opaque to X rays and will thus reveal the internal structure of a hollow organ. Barium X rays are useful in the investigation of any part of the digestive tract. They can reveal out-pouchings from the lower part of the throat (PHARYNGEAL POUCH), narrowing (stenosis or stricture) of the gullet (oesophagus), swallowing disorders, HIATUS HERNIA, stomach and duodenal ulcers, tumours or POLYPS anywhere in the bowel but especially in the colon, abnormal pouches (diverticula) in the colon, CROHN'S DISEASE (regional ileitis) and COELIAC DISEASE. a chemical element, atomic number 56, atomic weight 137.34, symbol Ba. See Table 6. Soluble salts, e.g. the chloride and the carbonate, are toxic. a mixture of barium and solid food, used as a contrast medium in radiographic studies of the esophagus, instead of liquid barium mixtures. used as a rodenticide. The baits are attractive to dogs. Clinical signs include salivation, convulsions and paralysis. preliminary experiments showing that diets deficient in barium fed to rats and guinea pigs depress growth have been neither invalidated nor confirmed. 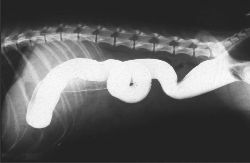 a dilute (5 to 20%) suspension of barium is introduced into a colon that has been emptied by starvation and previous enema. radio-opaque markers used to demonstrate intestinal obstruction and motility disorders; the spheres are given orally and their movement can be tracked radiographically. a strong (usually 100%) suspension of barium sulfate is administered to an animal which has been starved for at least 12 hours. x-ray examination using a barium mixture to help locate disorders in the esophagus, stomach, duodenum, and the small and large intestines. Called also barium test. a water-insoluble salt used as an opaque contrast medium for x-ray examination of the digestive tract. a small amount of barium paste or liquid administered orally and observed radiographically or by fluoroscopy for examination of swallowing and esophageal function. In 519 (75%), a gastroscopy was performed and in 138 (20%) a barium meal radiograph was taken. In one instance patient was subjected to barium meal examination to further evaluate the condition. Barium meal usually confirms presence of cardia and fundus of stomach above the diaphragm. However, despite present barium meal DAP readings not being corrected for patient mass, the mean DAP value (23 Gycm2) is comparable with a mean DAP value of 23. This is usually done with a barium meal, which is an X-ray examination of your stomach. HEALTH: Dr Gareth Smith: Common-sense answers to your health problems by the Seven Days doctor; Did sunbed bring me out in rash? If I fancy reviewing something a little bit different, my mate Sandy informed us he's going for a barium meal next week. Hypersensitivity reaction to single contrast barium meal studies in children. Delayed emptying of stomach on barium meal studies. The more old-fashioned test is a barium meal, which involves you taking a thick, milky drink, then being X- rayed. Further relevant investigations- straight X-ray of abdomen, abdominal ultrasonography, upper GI endoscopy, Barium meal follow through revealed gastric distension and a huge lymph node around 1st part of duodenum causing gastric outlet obstruction.